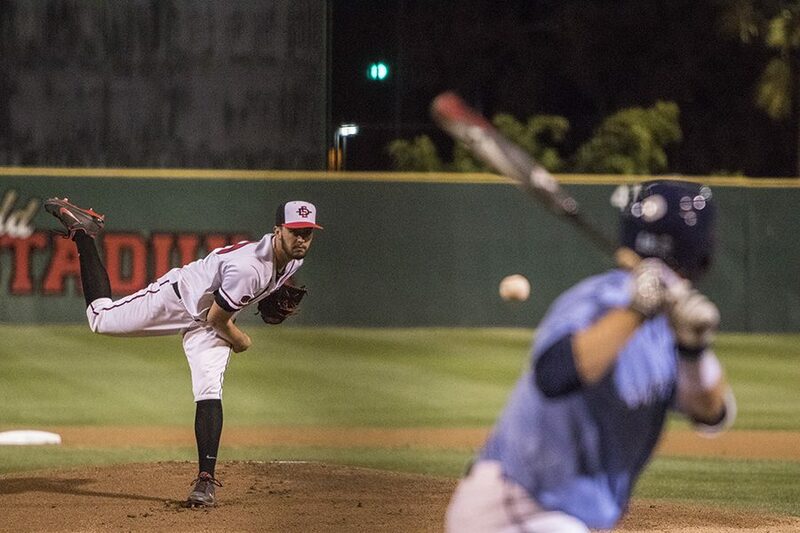 Daniel Ritcheson throws a pitch during the Aztecs 3-2 loss to USD on Feb. 20 at Tony Gwynn Stadium. 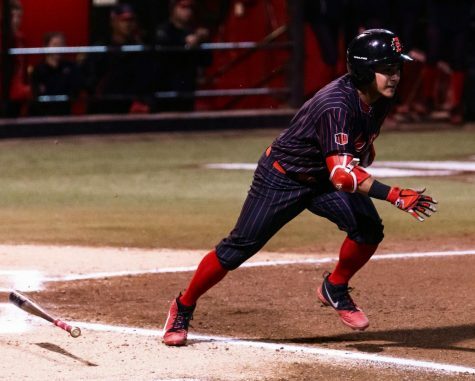 San Diego State baseball saw its season opening three game win streak snapped on Tuesday night, losing 3-2 to the University of San Diego in ten innings at Tony Gwynn Stadium. 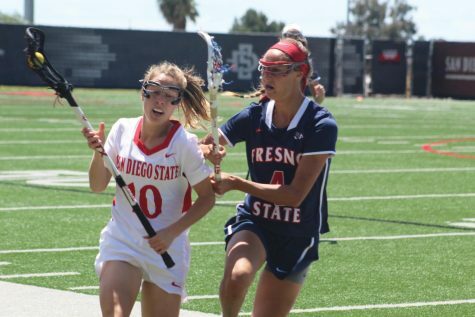 In the top of the sixth, Calabuig made a diving catch on a shallow pop fly to end the inning and hold a runner on second. 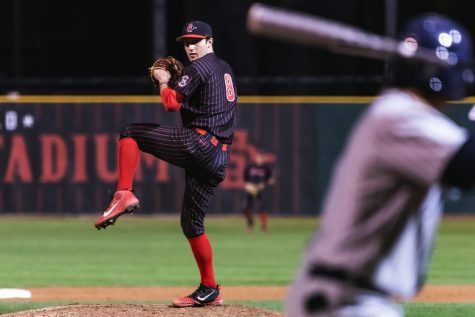 The Aztecs knocked Ponce out of the game after loading the bases in the bottom of the frame, with one out, but weren’t able to capitalize after junior reliever Anthony Donatella struck out the next two batters to get the Toreros out of the inning. 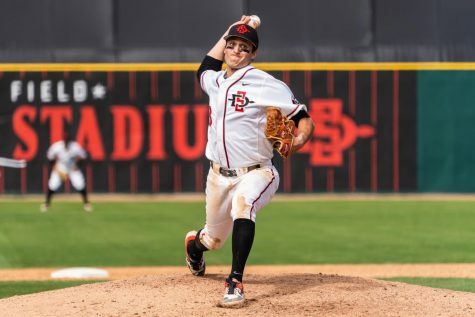 Freshman southpaw Jacob Flores, sophomore right hander Adrian Mardueno and seniors Jacob Erickson held USD scoreless over their combined three innings in relief for the Aztecs. Fernandez pitched a scoreless eighth, but the tie was broken after he gave up a run to USD in the top of the ninth. 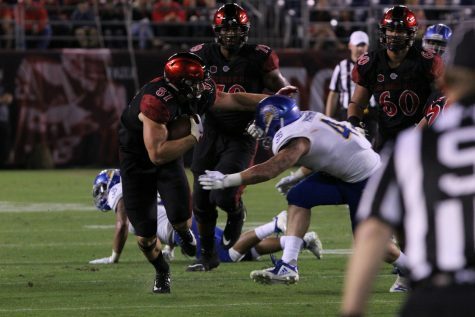 Senior infielder Grant Mayeaux was down to his last strike in the bottom of the ninth inning, but singled up the middle to drive home freshman outfielder Matt Rudick, knotting up the game at two apiece. The hit was the his first hit and RBI of the season for the senior veteran. 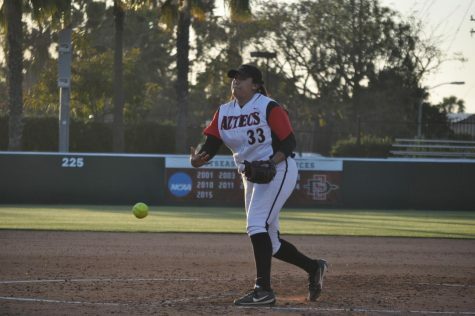 Escobedo struck out with runners on first and second to send the game into extra innings. Up next for the Aztecs is a date with Arizona in the Tony Gwynn Classic, starting on Feb. 22 at Tony Gwynn Stadium.